The following workshops are currently available, but please note that I am always happy to adapt a workshop to a particular group’s needs or invent a new, bespoke workshop to order – just ask! Please e-mail or telephone to discuss options. 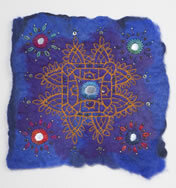 Note: I do not run textile workshops from my home and a suitable venue must be provided by the group. A one-day or half-day workshop exploring the use of Markal Paint Sticks through hand-cut stencils. 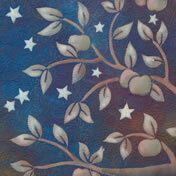 This is a project-based workshop but with plenty of flexibility built in and the results will be very varied! Samples and finished pieces will be present for inspiration. 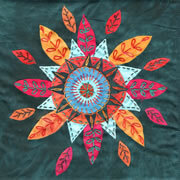 Note: The half-day workshop will involve stencilling only; the one-day workshop will include stitching. 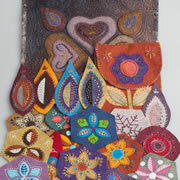 A one-day or half-day workshop embroidering on hand-made felt. This is an experimental workshop with the aim of trying out ideas and learning to exploit the special qualities of hand-made felt, and it is assumed that participants will have prepared their own felts for working with. 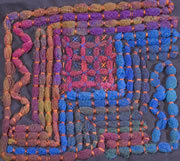 A one-day workshop in which soft merino felt is machine-stitched and then cut back to reveal embroidered and embellished silk; it is assumed that participants will have prepared their own felt. 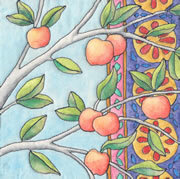 This is a project-based workshop but with plenty of flexibility built in and the results will be varied! A one-day or half-day workshop exploring the grey area between minimalism and over-the-top. This is an experimental workshop EITHER using paper scraps and bonding techniques on a small scale to produce a series of related designs that can then form the pages of a unique artist’s book OR using fabric and either bonded appliqué or stitch to produce a series of Journal Quilts. This version can also be an introduction to working in series, and to the advantages, uses and ‘how-to’ of Journal Quilt making. A one-day or half-day workshop couching threads and objects by hand. This is an experimental workshop exploring the tremendous variety of effects possible using simple couching techniques. Samples and finished pieces will be available for inspiration. 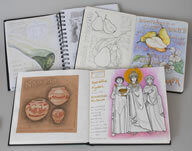 A one-day or half-day workshop making simple and not-so-simple books for use as sketchbooks, commonplace books and mementos – wonderful as gifts too! 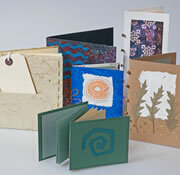 Participants will make several different books during the day and will take away experience and inspiration to make many more. Samples and finished books will be present for inspiration. 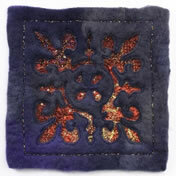 A one-day or half-day workshop exploring the unique qualities of commercial felt. Whether made from pure wool or recycled plastic, in junior school primaries or subtle hand-dyes, ready-made felt is widely available and lovely to stitch into, but how do you mark it? Solutions, tips, ideas and inspiration, and lots of hand stitching! A one-day or half-day workshop exploring the Inktense pencils and blocks by Derwent and the many different ways they can be used on fabric. A relaxed one-day workshop aimed at overcoming the well-known “I Can’t Draw” syndrome: drawing and art journaling for improvers, beginners, and the truly terrified! I firmly believe that there is no One Way to begin drawing or to improve one’s drawing, and also that much of the traditional Learn-to-Draw exercises are off-putting and damage confidence. This workshop will include the ideas, thoughts, tips, suggestions, pointers, warnings and guides that have helped me to arrive at the stage where I do keep an art journal, I do feel comfortable drawing “in public”, and I can see a steady improvement in my ability. And there will be lots of actual drawing, which is, after all, they key to getting better at it!